At a wind-swept camp for those displaced by Yemen’s war, a young Yemeni woman named Leemi, who supports her child and eight others, gratefully accepted aid from Saudi Arabia. That’s even after she said a Saudi-led airstrike destroyed her home near Sirwah, some 30 kilometres from the tent she now calls home in Marib province. Leemi’s story reflects the two faces of the kingdom in the nearly 3-year-old war in Yemen. Saudi Arabia says it has spent nearly a billion dollars in aid to Yemen and plans with its partners to spend another $1.5 billion. Meanwhile, the campaign by the Saudi-led coalition against Yemen’s Shia rebels, known as Houthis, has been a major cause of the country’s humanitarian disaster, rights groups say. The kingdom’s devastating air campaign repeatedly has struck markets, medical facilities and civilian targets, drawing international criticism. The coalition’s blockade on ports under Houthi control has been a main factor pushing the country into near starvation, according to United Nations (UN) agencies and rights groups. Saudi relief officials, however, stress their role has nothing to do with the ongoing military fight and say they also try to get their aid into Houthi-controlled territory as well. Associated Press journalists recently travelled into Yemen as part of a tour for foreign reporters organised by the Saudi-led coalition to highlight their relief efforts. Even before the war, Yemen was the Arab world’s poorest country and one of the world’s most water-scarce places. Since the war, Yemen’s 28 million people have been pushed to the brink of famine. Its poor water situation led to a cholera epidemic. There’s been an outbreak of diphtheria, a potentially fatal disease that primarily infects the throat and airways. A Saudi-led airstrike in 2015 destroyed cranes at the rebel-held Red Sea port of Hodeida, a major entryway for a country that imports 90 per cent of its food. The coalition maintains a blockade on Hodeida and other Houthi-controlled ports, an effort it says aims to prevent weapons from reaching the rebels. Rights groups like the Norwegian Refugee Council say Saudi Arabia must allow “unhindered” commercial imports into Yemen to ease the crisis. The Saudi-led coalition says it wants to increase importing capacity at the ports, but it is not clear if the Houthis will cooperate. 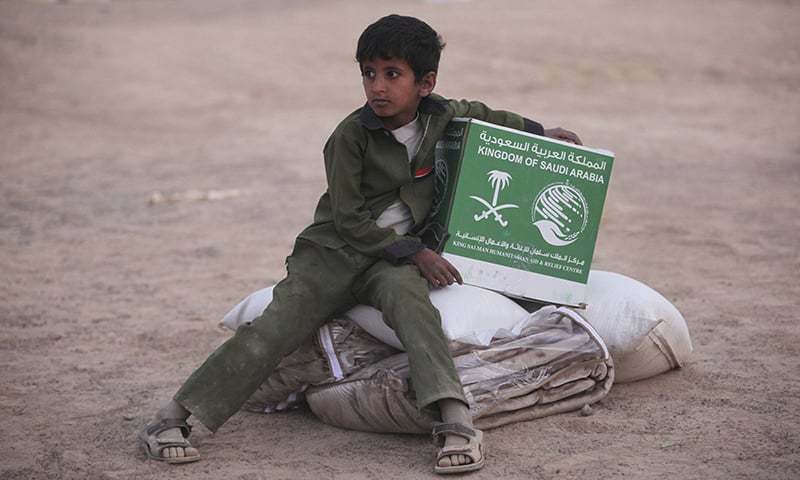 Saudi officials also accuse Houthi militants of diverting or stealing aid. “Yemen is slowly choking and millions of Yemenis are at risk of dying of hunger, cholera or any other consequence of the conflict in a severely impoverished country already on the brink of collapse prior to the current crisis,” the UN’s Development Program wrote an analysis in late January. To speed relief, the Saudis have run some 20 aid flights with secondhand American C-130 military transport planes into Marib, about 115 kilometres east of Sanaa. The aid has included rice, flour, sugar, salt, oil, beans and other foodstuffs, as well as blankets, tents, carpets and other material for those in need, said Fahad al-Osemy, the director of urgent aid at the King Salman Humanitarian Aid and Relief Center. The Saudis also provide food for Houthi-controlled territory in unmarked boxes that get distributed by local partners, he said. The Houthis control the capital, Sanaa, the north, and much of the central region and the western Red Sea coast. From May 2015 until this January, the King Salman Humanitarian Aid and Relief Center says it has spent $854 million on aid to Yemen, much of it on health care and food. In January, the kingdom announced the coalition will give another $1.5 billion in new humanitarian aid funding for distribution across UN agencies and other relief organisations. Medical care for wounded soldiers backing the internationally recognised government and civilians also remains a priority, Saudi officials said. At a Saudi-funded hospital in Marib, workers make prosthetics for those who have lost limbs in the conflict, their patients evenly split between soldiers and civilians. The UN has accused the Houthis of planting land mines and the Saudi-led coalition of using cluster bombs, both of which can lay dormant for long periods before killing and maiming civilians. Nearby, a 24-year-old soldier for Yemen’s government who gave his name as Hamas waited for a prosthetic for his left foot. He said he lost it to a Houthi land mine near Sanaa. Makeshift tent camps have sprung up throughout Marib, home to some of Yemen’s two million people displaced by the war. Some 112 “spontaneous settlements” are in Marib province alone, about 35 per cent of all those throughout Yemen, according to the UN refugee agency, UNHCR. At one such camp where Leemi lives, Yemeni men carrying Kalashnikov rifles, their traditional curved “janbiya” daggers tucked at their waist, greeted Saudi aid workers. Camp residents lined up for the aid, crowding around a desk where a relief worker kept track of the disbursements. The sun soon set behind the western mountains that mark the war’s front line, bringing armed soldiers and militiamen to the side of visiting journalists. “It’s not safe here,” they said, guiding the reporters away as night approached.